Since Rocky Mountain Audio Fest is primarily designed for consumer audiophiles, the buzz on the floor ranged from new products to component tweaks to which room was the best. Many of the people I spoke with were window-shopping and considering their next serious buy, so there wasn’t one particular item or room that ruled the floor conversation except CanJam. Even the speaker and cable manufacturers I spoke with shared their excitement about it. Tucked back just beyond the hotel’s fitness center was a large banquet hall in which you could find nearly every headphone on the planet presented by over 35 vendors. It felt like a college library on the eve of final exams – people everywhere and lots of indistinguishable murmuring, which has to be attributed to the quality of headphones on display. Being in a similar boat myself, I agree with Joe. 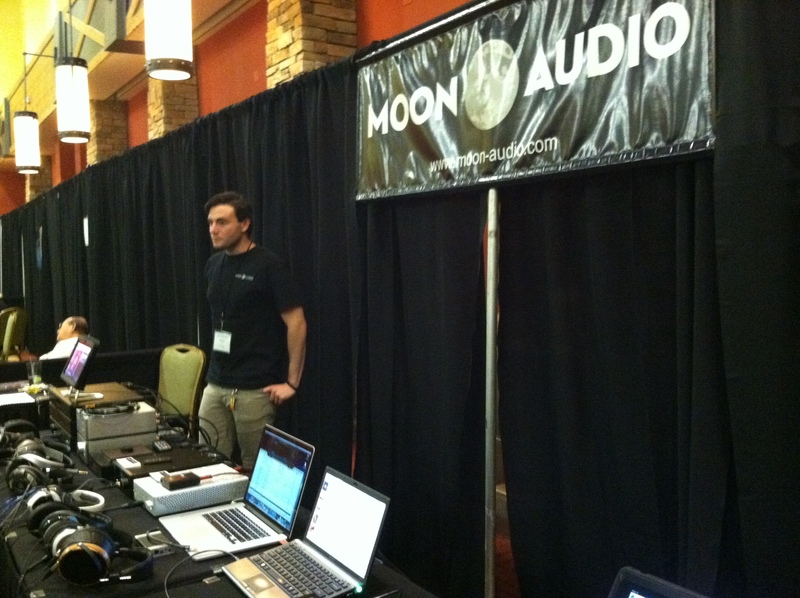 I was absolutely delighted to find Moon Audio, an Audiogon Featured Dealer, in CanJam with an extremely involved set-up. From a wide variety of music to headphone amps to headphones, I had no qualms about sitting down and playing with different options. Just behind me, Audiogon’s President, Steve Clay was trying out some Ultimate Ears Custom In-Ear Monitors. Normally, Steve avoids close-range listening – but these, as well as other exhibitors’ phones like Cavalli Audio, are so sophisticated, his perception is changing quickly. I spoke at length with John Peterson from Monster, you can catch a little bit of our interview below, and he also believes the perception is changing. Headphones/Earphones aren’t just for kids on the schoolbus anymore – the science and technology behind the latest high-end models gives the listener access to affordable high quality audio reproduction without waking up the whole house. So what do you think? Is it possible to get great sound out of headphones or earphones? Do you feel that this segment will help keep the hobby going? Let us know in the comments! Headphones are for kids. Not Audiophiles. (Even recording engineers don’t entirely trust them. )Their parents just want a small loudspeaker that sounds like the Mini Maggies but similar in size to the MMGs with a sub and which can be moved out of the way when your not using them. Hello!! 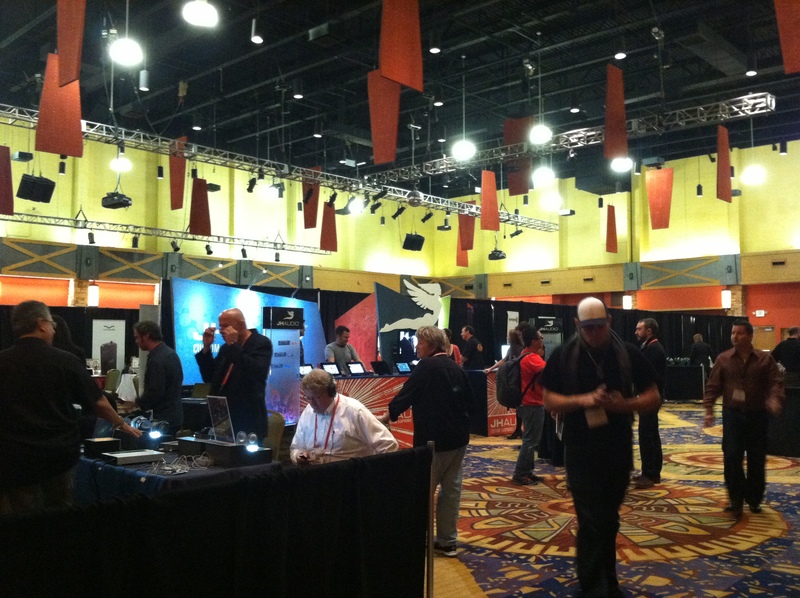 The buzz on the RMAF floor indicates that perception is changing surrounding headphones. While they won’t replace Maggies, for example, learning about headphone design/technology encourages newer audiophiles to educate themselves and grow the hobby. The younger attendees (20-30 years old) we spoke with felt that high-end headphones are a more affordable way to get into audiophilia while learning about their own personal preferences in regards to active listening. They won’t be replacing full systems anytime soon, but their importance to the tradition’s vitality shouldn’t be discounted, either. Thanks for your comment! You’re right – we posted info ramping up to the dates on our Facebook page and updates from Twitter that we left that out. Sorry! This year’s fest was held October 10-12 in Denver. Next year, Rocky Mountain Audio Fest will be held again at the Denver Marriott Tech Center October 11-13th. The comment that headphones are for kids is an interesting one as I have heard it touted more than once. It could be said that these “kids” are the future of audio and where does that leave the ageing speakerphile. Happily headphones are not for kids, especially not the audiophile world of headphones. This niche was once fairly isolated with people meeting in dark library corners to share their secret wisdoms. The true high end was somewhat limited to the electrostatic headphone world, equipment was not widely available or priced beyond the means of many who were interested in pursuing this arena of the audio world. Times have changed and although the greater public focus for headphones has been largely seen as a teen accessory to be worn around your neck, the growing interest over the past decade has spawned many new players in the market and encouraged the well established brands to continue R&D to produce technically excellent products such as the Sennheiser HD800 or Stax SR009. As speakers are unable to generate music independently, so too headphones need to be paired with the right ancillaries. There are cheap integrated amps that will produce music out of Wilson Puppies and just so not all headphone related equipment can be said to be equal. People quickly realized how much noise was on the speaker taps when they plugged their headphones into them and thus a whole new generation of equipment has come into being , this is a far cry from the headphone output on a preamplifier or ipod. I would indeed find it sad if recording engineers were not paying attention as the music they master is only as good as their critique of what they are hearing. Studio monitors do a fine job but there is detail and information that is easily discernible using the correct headphones. As an audiophile, I am partial to both speakers and headphones, I listen to near field monitors most days while at work, have a modest speaker system at home but life predicts that I mostly listen at night if ti all. For such times, I listen through a headphone palyback system considered world class by many studio engineers, the LCD3 from Audeze and a tube hybrid amplifier from Cavalli Audio. Neither of these companies would exist today were it not for the support and growing awareness of the fidelity available through headphones and the equipment made to enable their music reproduction. Canjam at RMAF this year epitomized these changing times as the headphone interest has clearly transitioned from a hobbyist driven endeavor to a well supported trade industry. I have been part of this transition and experienced it first hand over the past 15 years and would highly recommend anyone with preconceived notions to demo a respected system, possibly even going as far as trying out the Smyth Realiser. Good Headphones are a cheaper way, to enter High-End grounds. It’s not the same, specially on sound stage, but you can hear music with quality only attained by very, very expensive speakers. But anyway I prefer the sound stage on speakers. Headphones and more specifically in ear monitors are a valid audiophile segment. It is different but certainly an acceptable niche. Portable audio and digital audio give us sonic pleasure in a manner not before possible. Expansion of the audiophile market is a good thing. Biases aside just listen and appreciate what is happening.